13 September 2018 Paraplanners Powwow: Held in rolling countryside, under open skies, in teepees. We’re pleased as punch to announce Chris Hewitt, Technical Specialist for the FCA, as the national Powwow’s Guru speaker. Chris joined the regulator in 2010 and has spent this time concentrating on the supervision of firms delivering financial advice to retail consumers. Prior to that he worked in the financial advisory sector, holding a variety of research and paraplanning roles – we knew there was a reason why we liked him so much! What does he have planned for us? For his first ever appearance in a teepee, Chris is throwing himself right into the spirit by taking on the big topic that is DB transfers. The only question that remains is, will he be the first FCA person to don facepaint? A paraplanner is a unique role. We know that; you know that, but within the profession it’s much misunderstood or, worse, at times ignored. 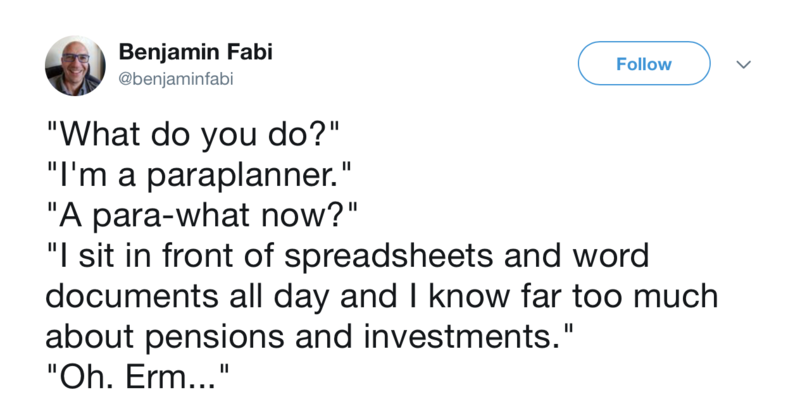 This tweet from Benjamin Fabi sums up the challenges we face. We need a way to articulate who we are and what we do. We need a way to explain the different kinds of paraplanner along the paraplanner spectrum. We need to get our story straight. So that’s what we’re going to start to do, with you, at the National Powwow. We’re going to start to put pen to paper with the people that know best – that’s you by the way…the Powwow paraplanning community – to explain what we do. With the help of supporters Ascentric, we are partnering with long standing Powwow friends, Quietroom to run campfires during the day to start to define the paraplanner role – discussing and finding the right words and phrases, identifying the nuances of different types of paraplanner and putting some shape to the this job we call paraplanning. And then of course, we’re going to chuck it into the free-for-all Powwow at the end of the day to see where we have got to and decide what next. When it comes to words and telling your story, Quietroom are experts. Feedback from you guys is that they are the bees knees, so we couldn’t think of anyone better to help out. And of course, we wouldn’t be able to arrange this without the support of Ascentric, so thanks Ascentric for helping us make this happen. Others have made great attempts at this and we know various projects are ongoing but we thought we’d do it in typical Powwow style, and get a teepee full of paraplanners to do it. Obviously fuelled by great food. The ‘pick n mix’ sessions are back by popular demand. 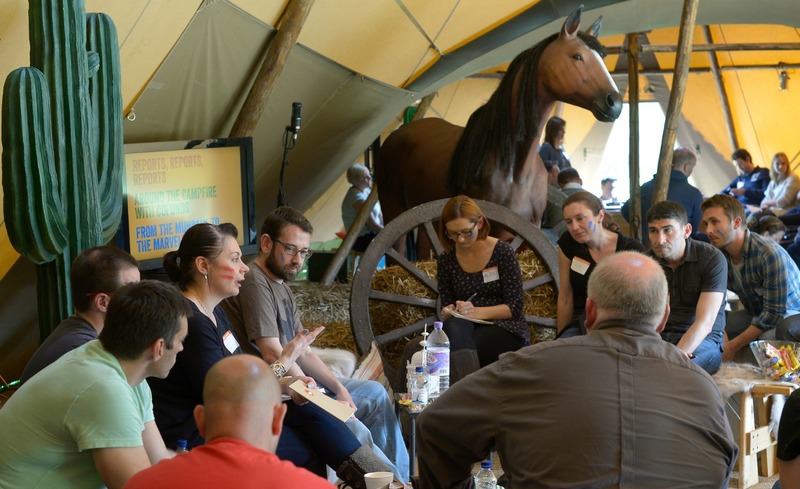 Adopting ‘unconference’ principles, Powwow participants will be invited to help determine the day’s topics and guests – we’re pretty sure there’s going to be a lot to talk about this year – MiFID II, GDPR anyone!? The topics you decide will form the focus of sessions whose formats range from small interactive workshops to the Powwow itself – a 45 minute open discussion with all participants, designed to discuss the future of the profession, and conducted under Chatham House Rules. So how does that all fit into the day? Good question. Here’s how. The Powwow’s taking place on 13 September 2018 at Upper Aynho Grounds in Northamptonshire. The start time is 10:00 and registration will open from 08:30 – where we’ll be serving a Powwow brekkie. If you’re thinking of staying overnight before the Powwow, we’ve arranged special rates at The Cartwright Hotel in Aynho for the evening of 12 September 2018. But, beware, these rates are only available for bookings made before 31 July 2018. After that, usual rates will apply. To make sure you secure the special rate, you’ll need to book your room by phone using a special code. The code is included in the confirmation email that you’ll receive when you book your ticket. If hotels in picturesque Northants and Oxfordshire villages don’t appeal, there is always the Travelodge at Cherwell Valley Services, which is 10 minutes from Upper Aynho Grounds, and a Holiday Inn Express close to Junction 11 in Banbury. We expect to host a Powwow dinner – or ‘Chowwow’ – on the evening of 12 September 2018 at The Cartwright Hotel in Aynho. When you book your place at the Powwow you’ll be asked to let us know if you’d be interested in joining the Chowwow. If you are, just let us know, and we’ll be in touch with more details closer to the event. The dinner kicks off with drinks in the bar at 7.30pm.